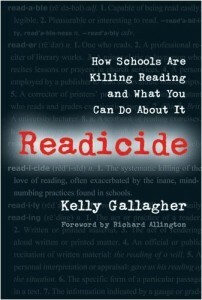 Over the summer, I was inspired and awakened after reading Kelly Gallagher’s Readicide: How Schools are Killing Readers and What You Can Do About It. Kelly Gallagher is a high school English teacher in Anaheim, CA whose theories I’ve been advocating and utilizing for a few years. Four years ago, I designed our school’s sophomore reading strategies classes based on his philosophies in Deeper Reading: Comprehending Challenging Texts, and Teaching Adolescent Writers afforded me new creative opportunities with my senior expository writing students. Readicide talks about the “mind-numbing” practices in our schools that turn students off to reading such as the overuse of study guides and paragraph-by-paragraph overanalysis of literature. He illustrates data-based research to show just how drastically reading is dying before offering specific strategies to curb this epidemic. It’s a quick read – it took me all of two hours to sweep through. For those that haven’t read it, GG highly recommends it! During our department meeting today, we viewed the 20 minute DVD Gallagher produced that depicts his guidance with the Article of the Week (AoW). AoW is one of the practices he advocates to curb ‘readicide.’ He points out that while his 9th grade English students could analyze characters in Lord of the Flies, they didn’t know how to discern Al Quaeda from Al Gore nor could they identify the current Vice President of the United States. This brings up a great point – most students don’t read outside of the classroom; most students are current-event-illiterate. AoW combats that. It involves sharing a current events article (i.e. Business Week, Wall Street Journal, etc) with the class at the beginning of the week and then asking them to turn in a response along with evidence of active reading at the end of the week. Gallagher graciously shares all articles he used last year for his 9th and 10th grade English classes along with his current collection he is beginning this year. 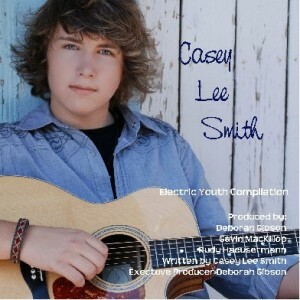 He shares them on his website, kellygallagher.org. He asserts that AoW is now practiced in every single English classroom at his school; consequently, students leave the building at the end of the year having read approximately 140 pertinent articles they would otherwise have not been exposed to. I am definitely incorporating AoWs into my reading classes as well are many of my colleagues. I am using some of Gallagher’s articles along with my own. Grading Girl gives Readicide an A+ for eye-opening data, researched reasonings, and practical strategies that assist teachers with helping students gain back an interest in reading and, thus, an interest in life.